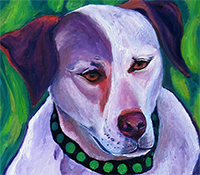 After painting the big blue dog painting (Fernie) a couple of months ago, I decided I wanted to paint my dog violet using purple. Violet is my painting buddy and so she even knows what it means to "go paint". I decided that such a loyal painting assistant needed another painting dedicated to her. It was really fun changing the colors around too. I was thinking a lot about Picasso and how he decided to paint everything in blue for a while. And while I was painting the background I was thinking about Van Gogh a lot. I love his thick paint! And I love the interaction of all these saturated colors.